Does Bankruptcy Really Hurt Your Credit Score? Bankruptcy provides you with relief from your creditors and burdensome debts. Essentially, it gives you a fresh start financially. But, that fresh start does come with a price, especially when it comes to your credit. While your credit score does take a hit, initially, bankruptcy is not necessarily that bad for your credit score. In looking at both the short and long-term scheme of things, you may end up with a better credit score just by filing bankruptcy. 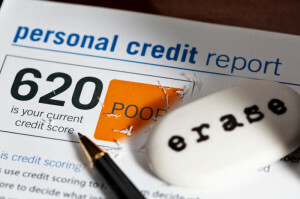 Your credit score, also known as your FICO score, is what creditors look at to extend future credit. It is based on a secret algorithm that assesses your total debt, late payments, and credit history. If you have a lot of debts, especially past due or collection accounts, it is likely you already have a low FICO score. When you file bankruptcy, your credit score will drop a little further, but only temporarily. If you have a great FICO score and file, you will notice a larger drop than if you already had a low score. If your score is already very low and considered “very poor, then you won’t see much of a change and you may even notice it is easier to raise your score post-bankruptcy. Your credit score shouldn’t be more important than your financial situation. If you’re filing bankruptcy, you’re over your head financially; therefore, you shouldn’t worry about your score or the need to obtain new credit in the future. Regardless of this fact, even after bankruptcy, you may notice you have a better score, even though the bankruptcy will remain on your credit profile for 10 years. Bankruptcy does a lot of things to your credit some of which you will see right away. First, all delinquent credit accounts and late payments will be removed from your credit report; and these are things that lower your FICO score anyway. Debts will be reported as discharged, which means within a few months you could see your score rise. Also, bankruptcy lowers your debt-to-credit ratio, which accounts for about 30 percent of your FICO score. So, as your accounts are dropped and discharged, your debt-to-credit ratio will lower and your credit score increases. By removing negative credit history, you have the chance to start over and rebuild credit over time. You can get a new loan, repay it on time, and establish a more positive credit history. Credit scores can be changed for the better when you file bankruptcy, but only if your attorney handles your case appropriately. Get expert advice on fixing your credit score while still getting rid of your debts by speaking with the Boca Raton bankruptcy attorneys at the Law Office of Kelley & Fulton today. Schedule your no obligation consultation by dialing 561-491-1200.